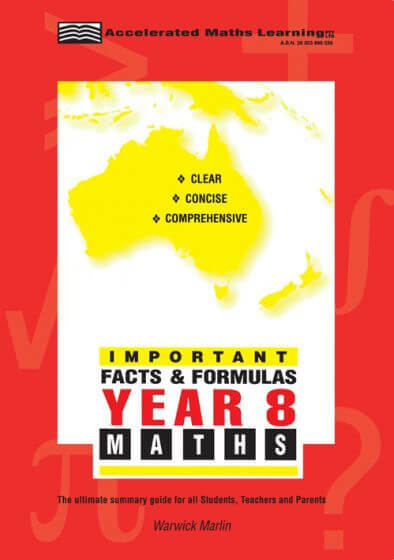 This is a unique series in that no one has yet written and published comprehensive and high quality summary guides that cater for students of all abilities from Year 5 through to Year 12 Extension 1 (2 Unit and 3 Unit Course). Each booklet summarises all vital facts, formulas, key words and sets of steps relating to the syllabus of the particular year. By using these booklets students can now test themselves just before an exam, or get their friends or parents to test them. Every major topic in the relevant syllabus has been concisely and comprehensively summarized on only two pages. Revision of essential work from previous years is also summarized in each booklet. Each of the nine (9) titles is written by one author (Warwick Marlin) – which guarantees that the same style, format, continuity and conciseness runs through all the books. These rule booklets will save students many valuable hours in researching and writing out their own summaries. The typesetting, layout, presentation and user friendliness is also a very big feature. The pages are not crammed and overloaded with information, while at the same time the books comprehensively summarise all key facts and formulas in the syllabus. Each booklet is printed in two (2) colours, with each important subtitle highlighted in red so that students can memorise them more easily. There are several blank pages at the end of each booklet for students to write down any additional notes and examples that they feel are necessary. Each booklet concisely summarises, chapter by chapter, the corresponding Understanding Maths book. They make an excellent and very useful companion book for final, last minute revision and swotting of key facts, formulas and theorems. At the end of each double page topic summary, there is a reference given to the corresponding more in-depth Understanding Maths book. This means that students who are ‘swotting’ for a test while using this series will be able to quickly cross-reference to the more in-depth book if they have difficulty recognizing a particular formula or rule. Guiding students to VCE success year after year. Cambridge Checkpoints VCE 2018, Victoria's most popular study guides, are updated regularly to incorporate recent official VCE exams and changes to the VCE, providing the most up-to-date exam preparation available.